Planning activities to date have led to the selection of a preferred concept for Station Plaza, the grand civic space surrounding all four sides of 30th Street Station. In 2018, Amtrak will continue to refine the design concept and will begin looking for additional funding to advance the project. Planning and concept design activities are underway for the North Concourse, a proposed new passenger concourse on the Arch Street side of the station to include passenger waiting and boarding areas and retail. These activities are focused on refining the layout of public concourse and back-of-house station operational spaces and to evaluate circulation pathways. Amtrak and SEPTA are coordinating planning and concept design work for the proposed underground retail concourse and connection between 30th Street Station and the subway and trolley. These activities are focused on refining the layout of the retail concourse and to identify the best locations for stair and elevator access. PennDOT is conducting a Ramp Modification Study to analyze the I-76 / I-676 ramp improvements and modifications to the adjacent street network, including Arch Street, 30th Street, Market Street, and Schuylkill Avenue, proposed by the District Plan. Work is underway to design improvements to the SEPTA 30th Street subway and trolley station, which include new elevators at the 31st Street entrance and a new head house at 30th Street. This project is being coordinated with Drexel University and Brandywine Realty Trust’s ‘Drexel Square’ civic space project at One Drexel Plaza. Amtrak issued a Request for Proposals (RFP) in the fall of 2016 seeking a developer for Parcel 1, a roughly 32,500 square foot property owned by Amtrak and located at the corner of 30th St and JFK Blvd. It is Amtrak’s intention to find the appropriate partner to unlock the untapped value from Parcel 1 and activate the space, extending the vibrancy of 30th Street Station to create an attractive and exciting enhancement to the District. Amtrak anticipates selecting a developer in calendar year 2017. 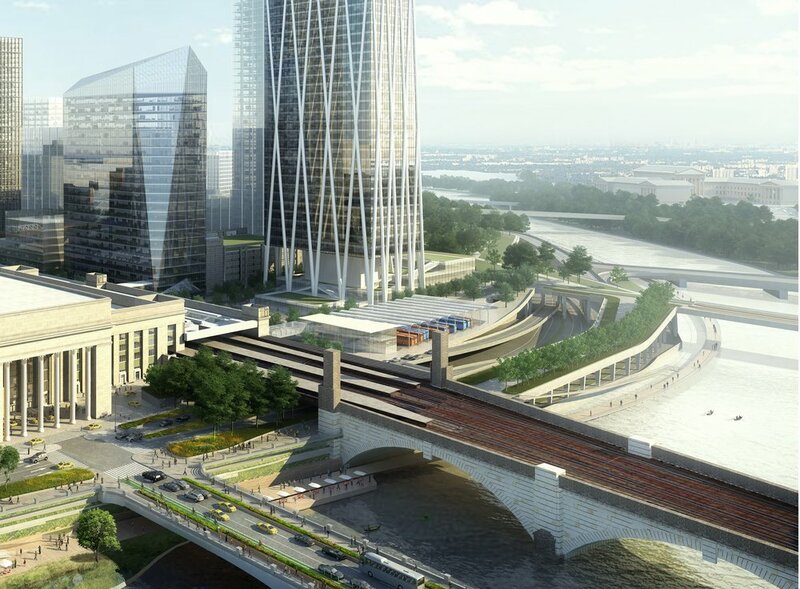 Amtrak will seek a Master Developer partnership with a visionary team made up of world-class architects, engineers and developers to help build the vision in the District Plan. The process will include a two-step solicitation, including a Request for Qualifications (RFQ) due in the summer of 2017, followed by a Request for Proposals (RFP) that will be issued to a short-list of qualified Master Developer teams. Amtrak leadership and private sector professionals came together to learn and discuss the upcoming solicitation opportunity at 30th Street Station at the July 28th Industry Day Event. For more information, please visit: NEC Philadelphia 30th Street Station. This project will replace and modernize the SEPTA overhead contact system from 30th Street Station westbound to K and Zoo interlockings, an area that includes SEPTA's Powelton Yard. The work being performed also includes repairs to aging catenary support structures, foundations, retaining walls, tunnels and site drainage.